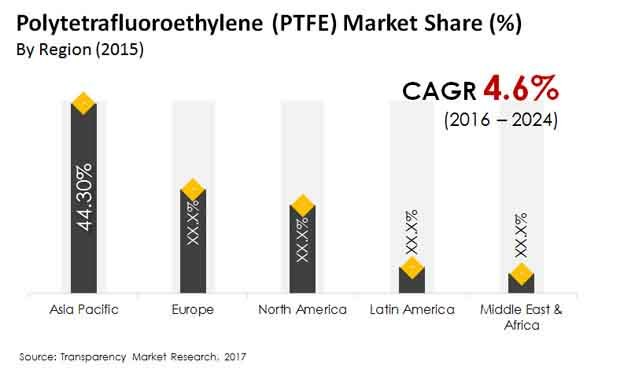 The global polytetrafluoroethylene PTFE Market is highly concentrated, as reported by Transparency Market Research (TMR). The vendor landscape if this market is composed of some regional as well as global players. A few small-scaled vendors also operate in the global polytetrafluoroethylene PTFE market. Vendors are largely involved in expanding their production capacities. Growing innovations in the industry is likely to amplify competition between the market vendors. Players are also expected to focus on research and development activities in order to gain traction in the global PTFE market. Chemours Company, Asahi Glass Co., Ltd., 3M, and Solvay are reported to be current top participants operating in the global polytetrafluoroethylene (PTFE) market. The companies together accounted for almost 63% of the overall market share in 2015. A key strategy being adopted by top vendors is the expansion to developing markets. As regions like the Asia Pacific offer raw materials at cheaper prices, vendors are seen shifting their base to these markets. According to TMR’s projections, the global polytetrafluoroethylene (PTFE) market is forecasted to rise at a 4.6% CAGR over the forecast period 2016 to 2024. The PTFE market stood at an evaluation of US$3.48 bn in 2015, and is projected to reach US$5.18 bn by 2024. Segmented on the basis of products, micro powder PTFE, with a 30.8% share of the market as estimated in 2015, is poised to lead the global PTFE market over the forecast period. Geographically, Asia Pacific is predicted to emerge as the key regional market. Asia Pacific held nearly 44% of the total share of the global polytetrafluoroethylene (PTFE) market in 2015. The region is expected to remain dominant over the forecast period. PTFE has the ability to withstand extremely high temperatures (up to 2500 degree Celsius). At the same time, the product offers low chemical resistance and friction. On account of these properties, polytetrafluoroethylene is being widely adopted in the automotive industry. Several components used in vehicles such as brake lines, sump hoses, clutch, and brake can use PTFE. Rally vehicles which need hydraulic fluid, clutch fluid, and cooling, can also make use of the product to a large extent. The growing demand from these sectors is contributing to the growth of the polytetrafluoroethylene market. Recently, a key vendor in the global polytetrafluoroethylene market 3M has developed a novel PTFE processing technology. The technique uses 3D printing technology as a new and to process fully-fluorinated polymers such as PTFE. This process allows the production of complex and small volume PTFE parts without the need for expensive traditional processing techniques. This new, 3D manufacturing process is expected to provide enhanced flexibility to plastics manufacturers. Novel innovations such as these are expected to boost the growth of the global polytetrafluoroethylene (PTFE) market over the coming years.